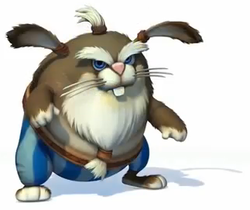 Fluffs are rabbit-like members of the Snowmad family and are uncommon enemies appearing in Donkey Kong Country: Tropical Freeze. They have brown fur, a beard, a tuft of white hair on their head, and they wear blue pants. Fluffs always jump around in a set area, and they can be defeated by either being stomped on, rolled into, throwing a barrel at them, or running into them with Rambi. Helmet-wearing Fluffs called Tuff Fluffs also appear, as do larger variants known as Hareys and Harolds. Unlike the large members from other species that have lower-pitched voices, larger Fluffs share the same voice as regular Fluffs. The smaller Fluffs also jump slightly higher than the larger Fluffs. Jobitto Jobbit; derived from "rabbit" 「ラビット」 rabitto. This page was last edited on February 27, 2019, at 01:14.